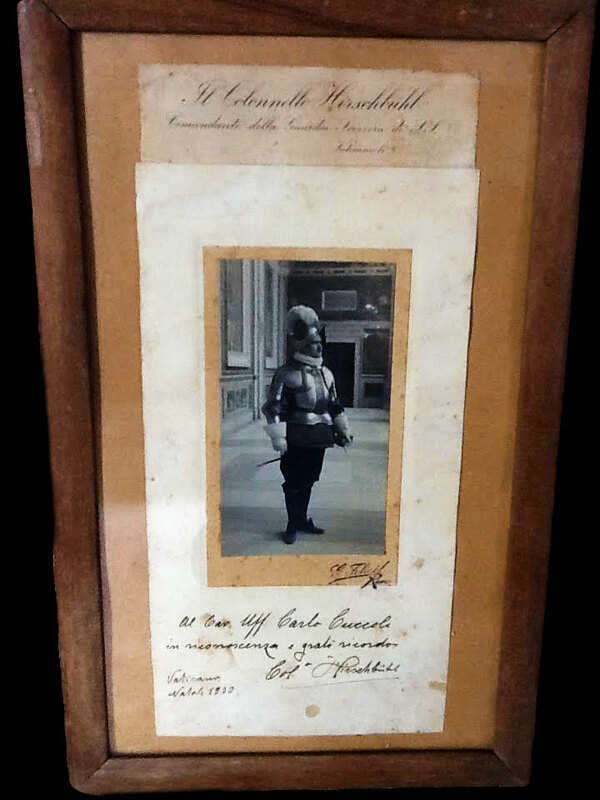 The item is a vintage photograph of the Vatican Swiss Guard Commander, Alois Hirschbuhl, in 1930. He served as commandant from 1921-1935. The artifact includes both a dedication by him and his autograph. It is in good condition in a simple, vintage frame and is a great addition to the Swiss Guard portion of this Collection. Commander Hirschbuhl was from the Canton of Graubunden, a region in eastern Switzerland, known for its dramatic Alpine scenery, and its skiing and snowboarding. The Engadin Valley has traditional whitewashed houses decorated with sgraffito (designs painted with plaster). St. Moritz, an upscale resort town, offers 5 ski complexes and an Olympic ski-jumping hill. Davos, home to the annual World Economic Forum, is also popular for skiing and hiking.